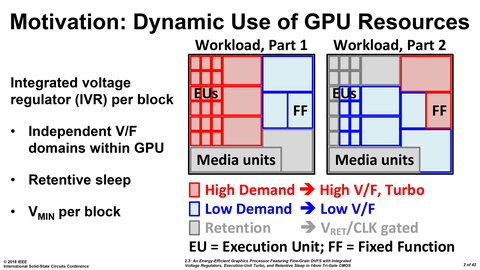 At the IEEE International Solid State Circuits Conference in San Francisco late last week, Intel unveiled plans for a prototype discrete GPU. 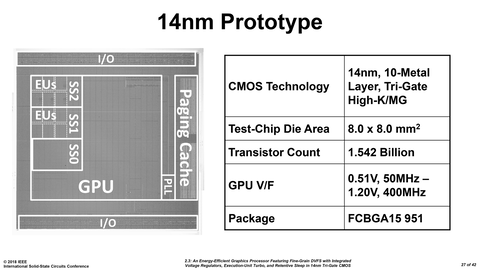 Designed to be built on Intel's 14nm process, the early test chip would feature 1.5 billion transistors and its clock speeds would range between 50 and 400MHz, reports Notebook Check (via PCWatch, Japan), indicating a leaning towards efficiency over raw performance. 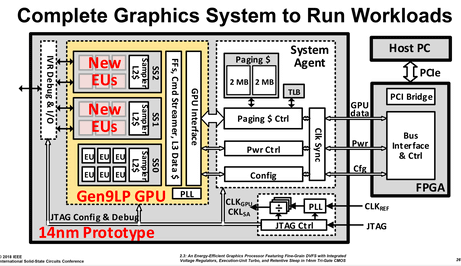 Intel has made great progress in its integrated graphics chips over recent years. 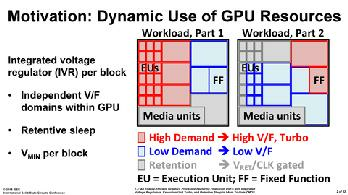 However, for any kind of modern 3D games, even its best efforts just scrape by - requiring lower detail settings, resolutions, and delivering lower fps than entry-level discrete GPUs can. On a portable platform it's easy to understand the thrifty power budgets Intel strains to keep within for its CPUs with integrated graphics. Things do look set to change, though, with the Intel 8th gen Core G-series processors, combining AMD Radeon Vega cores, which will initially target portables. Additionally, AMD's former chief GPU architect Raja Koduri joined Intel back in November last year. A statement at the time of Koduri's appointment said "Koduri leads the expansion of Intel’s leading position in integrated graphics for the PC market with discrete graphics solutions for a broad range of computing segments". 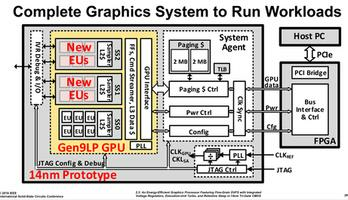 Furthermore, at that time Intel said that it plans to "aggressively expand our computing and graphics capabilities". It is not known whether this prototype chip will every become part of a shipping product but it is a sign that Intel will reach higher to compete with discrete PC GPU makers in the coming months / years. I'm torn between welcoming a (possible) third player in the mainstream discreet GPU market and shunning another scumbag GPU maker. 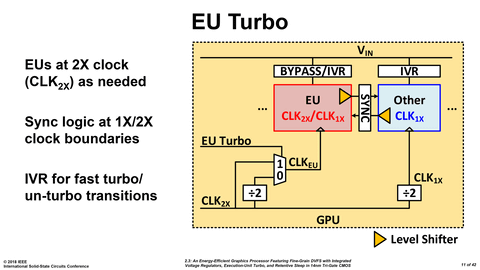 I guess this is the steps towards an AI co-processor as the long term goal, more so than it is gaming. NVidia is running away with that market at the moment which is bad for both AMD and Intel. It sounds like this is designed more as a drop in upgrade to support newer video standards (things like .265 can't be hardware accelerated on their older built in GPUs,) than trying to take on the gaming GPU market. At least initially. Obviously the only question the investors will ask is how well does it mine? Low clock speeds. High efficiency. “Workload” focused. Intel makes a play for the mining market?